Glass blowing can be a very dangerous process if performed without the necessary skills, tools, and safety measures. This is because the process involves the glass being heated to high temperatures and then molding it carefully into place. Taking proper care while blowing and using adequate glass blowing supplies is of crucial importance to efficiently complete the process. Safety involves being cautious about high temperatures. In order to be cautious you need to have proper protective gear on before starting. This involves covering your body with a protective layer and wearing goggles to protect to eyes. Since glass can get really hot, it is always a good idea to keep the workplace secure, take care while touching the glass and not letting children and pets inside your workplace. If you get a minor burn despite taking precautions, you can always sooth it by running cold water over it for about 10 minutes. 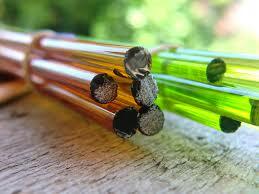 Glass tubing is available in different sizes. The type and size of tubing is chosen depending on the type of glass being worked on. The work surface when it comes to working with glass should always be heat proof. A great example of a surface is Syndanio board, because this material is a thermal insulator and therefore has the ability to withstand high temperatures. A metal sheet can also be used but hot glass cannot be placed on a metal sheet due to cracking of the glass when it is cooled. A mixture of gas, air and oxygen burners are great for this work, but according to the type of glass you are working on, a simple propane or butane burners can also be used. A sharp knife needs to be used for tube scratching while they are in the process of being severed. Since these rods are heat resistant, they are used for flaring out the tube ends. The ends are also used in the process of shaping and flattening the heated glass. The kiln is used for storing the heated glass until it is cooled. This is because the annealing kiln can withstand high temperatures and is great for protecting the glass as it cools. Another great way to cool glass is Vermiculite which is also very cheap, naturally occurring and not toxic. Do avoid breathing the dust. The entire process is really technical and expert knowledge is needed in knowing how to go about it. These glass blowing supplies are sufficient for the job and bring efficiency in the entire process. Safety is of at the utmost importance any time working with glass products and an open flame. It is crucial to utilize and wear proper safety equipment while working. Safety goggles or glasses are essential to protect your eyes, a mask may even be necessary for some processes.